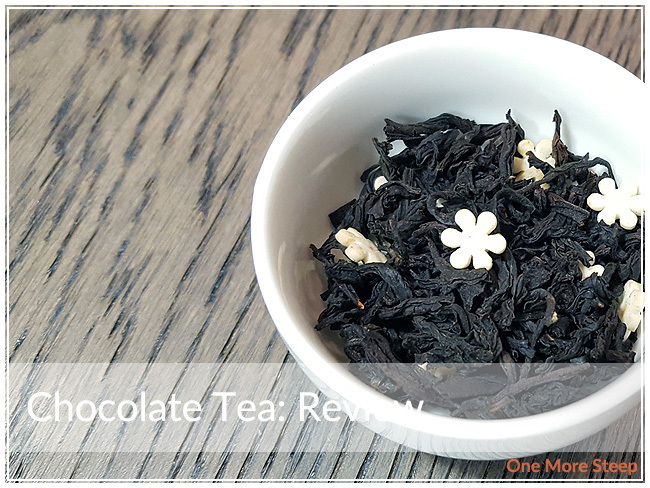 Fox Tea Club has provided me with Chocolate Tea for the purposes of providing an honest review. I will be honest, I was a bit apprehensive about seeing a Chocolate Tea in the goodies that Fox Tea Club sent me, but I’m game to try just about anything as long as it doesn’t contain coffee. Chocolate Tea actually does smell like milk chocolate, which always a good start. I found that I couldn’t smell much of the black tea base, but given the name of the tea and the fact that the smell matches the name, all is forgiven. 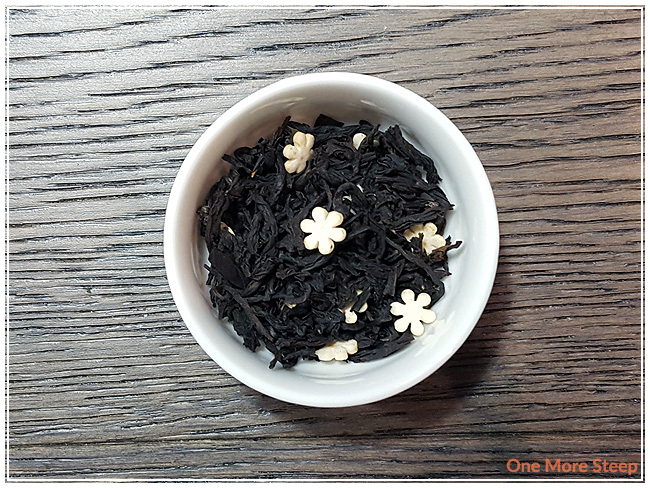 Chocolate Tea is made up of black tea, cacao beans, caramel, foxberry, and sea buckthorn. One curious thing is that the sprinkles aren’t mentioned in the ingredients list at the time of writing, but are very much present in the black tea blend itself. 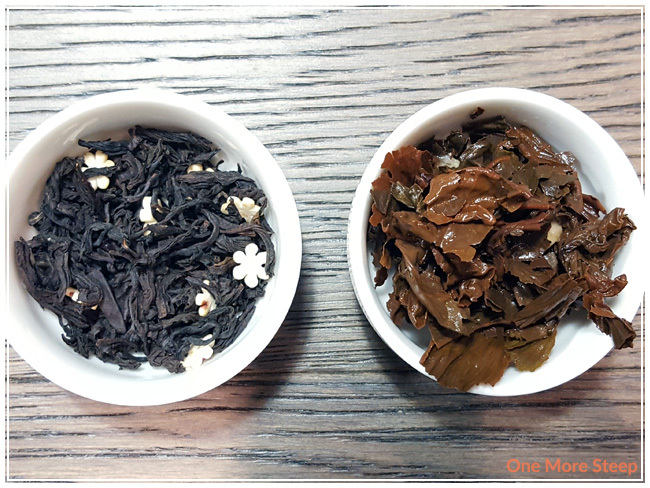 They remind me a lot of snowflakes, so perhaps this an early winter-themed tea review for you all. There were no steeping instructions on the Fox Tea Club website, but the label suggested steeped in 205°F (96°C) water for 3 minutes and that the tea could been steeped twice. I followed the steeping instructions for my initial steep of Chocolate Tea. 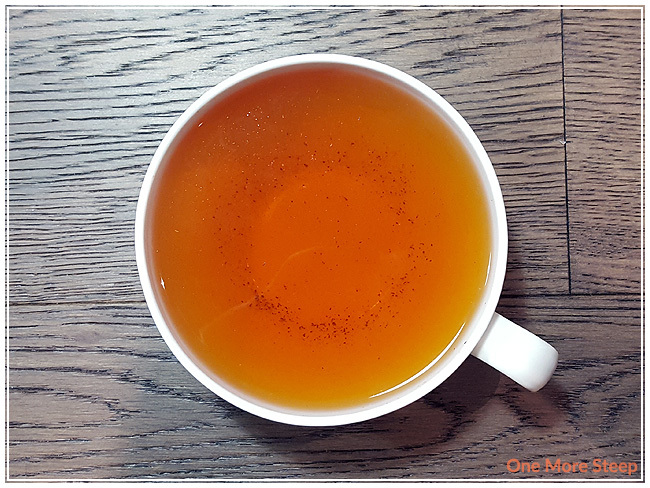 Chocolate Tea steeps to a beautiful reddish-brown colour, very much like a regular black tea. There’s small flecks of oil across the top which I’m attributing to the snowflake sprinkles that melted in my tea. The steeped Chocolate Tea stills smell remarkably like milk chocolate, which I am pleasantly surprised by because usually teas that smell like chocolate prior to being steeped don’t necessarily smell like chocolate post-steep. I found on first sip, this tea was like a watery hot chocolate. It does taste like hot chocolate, but I can also taste the black tea base which is quite bold in comparison to the chocolate flavours. There’s a nice sweetness to it, which I think can be easily attributed to the sprinkles. I did add some evaporated milk to this tea, and found that the taste was a lot more to my liking. Straight, I found the chocolate flavour be quite watery. With the addition of the milk, I found the tea to be more of a creamy chocolate flavour and it tasted more like hot chocolate. I did attempt to resteep Chocolate Tea, but found the flavours were lacking compared to the first steep and I didn’t enjoy it. I would say that Chocolate Tea is good for one steep only. 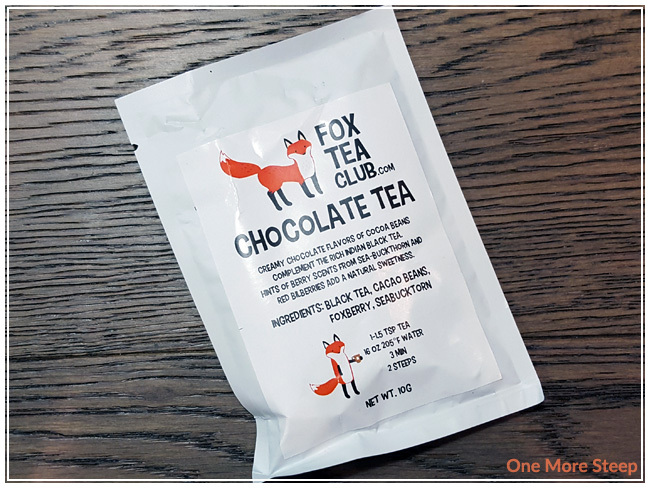 I liked Fox Tea Club’s Chocolate Tea. If I were given a cup of this tea straight, I probably wouldn’t finish it because it tastes like a weak and watery hot chocolate. I would highly recommend adding some cream or evaporated milk into this tea to make it more creamy and it gets to be a lot closer to a hot chocolate flavour. It does smell a lot like chocolate both with the dry leaf and when it’s steeped, which is a nice quality about this black tea blend.